Tidbits to help you plan your trip! Metered street parking in town will be limited throughout the weekend due to road closures. While attending our event, we recommend that you park your car once and enjoy your day without the worry of expired meters. See below for details on parking for A Gettysburg Christmas Festival. Metered street parking in town will be limited throughout the day due to road closures. While attending our event, we recommend that you park your car once and enjoy your day without the worry of expired meters. - If you are staying the night, we ask that you leave your car at your hotel/B&B if at all possible. - If you are staying in a hotel/B&B in town, we encourage you to walk to the festivities! Since we hope you won't be moving your car (see above), we have outlined some ways to get from here to there. 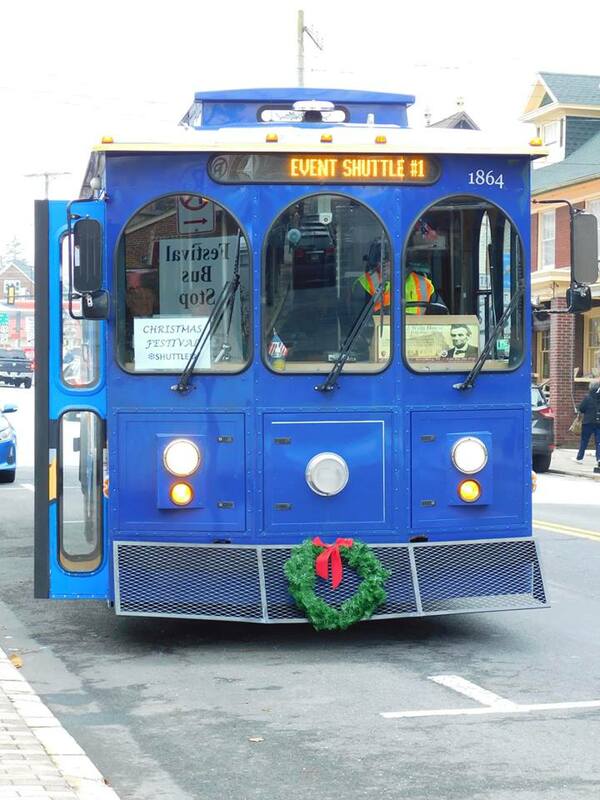 Ride our Trolley - the Freedom Transit - free all day from the Downtown Transit Center (103 Carlisle Street) to Steinwehr Avenue and back! Last trip from Steinwehr Avenue at 9:45 pm. Enjoy a free ride on a horse drawn carriage! Carriages will be shuttling event goers to and from Lincoln Square to Steinwehr Avenue between the hours of 10 am and 4 pm. Expect to wait in line and please disembark from the carriage after a one-way trip to allow others to enjoy the experience. If you wish to make your way back to where you started, please get back in line or take a stroll. Gettysburg is a walkable town - it's less than a mile to walk from Lincoln Square to the Friendly's restaurant on Steinwehr Avenue. There's so much to see and do - and it's much easier to experience on foot! We hope you plan to stay the night - or the weekend - in Gettysburg for the event! Are you wondering where to stay? Lodging options will fill up, so make your reservation now! Click here to view a list of lodging in the Gettysburg area!